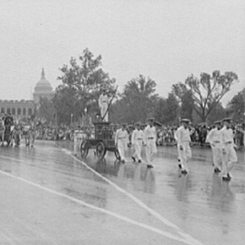 Image courtesy of Library of Congress This 1933 image features a Labor Day parade in front of the U.S. Capitol. On this date, President Grover Cleveland signed S. 730 into law declaring Labor Day a national holiday. Since 1882, Labor Day had been celebrated at the local and state level. From 1887 to 1894, 23 states enacted a Labor Day holiday. But according to the Washington Post, the celebration alternated between the first day of September, the first Monday of September, and the first Saturday of September depending on the location. After being introduced in August 1893, S. 730 sat for ten months without debate in the Senate. Once Senate leaders brought it to the floor, however, the bill quickly passed. Four days later, on June 26, 1894, the Chairman of the House Labor Committee, Lawrence McGann of Illinois, began consideration of the Senate bill in the House, replacing an earlier House version sponsored by Amos Cummings of New York. The legislation passed with no objection and was sent to the President. The response to the new holiday was overwhelmingly positive. Labor unions in cities such as Boston, Nashville, and St. Louis celebrated with parades and picnics. Large turnouts in Chicago (30,000) and Baltimore (10,000) underscored the holiday’s popularity. At the first official Labor Day parade in Chicago, Chairman McGann reminded the revelers, “Let us each Labor day, hold a congress and formulate propositions for the amelioration of the people. Send them to your Representatives with your earnest, intelligent indorsement [sic], and the laws will be changed.” Over time, Members of Congress began utilizing their role as participants in numerous Labor Day holiday parades as a means to reach out to constituents.